​Killer Orion is a very calm, sweet boy, exactly what Annelise wanted as a new family member, she plans on training him as a therapy dog and taking him to work daily. Ron and son, Ronnie have a list of names and after they get to know him will make the decision, it will definitely be a name related to the Beatles. Jack Russel, Ringo is behind the family, he didn't want in the family photo. 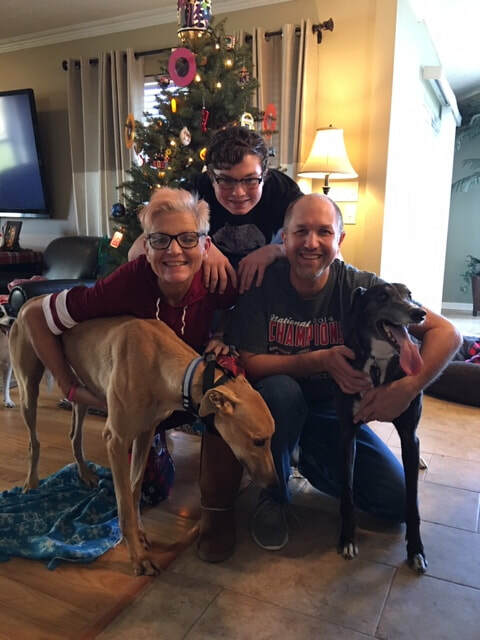 Pretty black greyhound is Rosie and she is THRILLED to have a new greyhound friend in her home, especially sense they lost their male, Bowie earlier in the year.